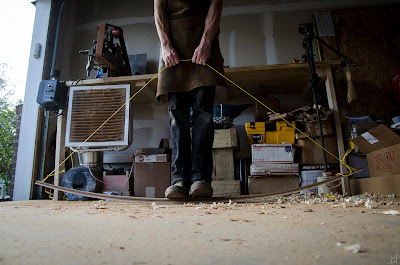 It has been quite some time since I posted anything archery related here and thought a recent project would be the perfect opportunity to reconnect with a good number of people who come here after watching the longbow video I made a number of years ago. Since making that first bow, I have always wanted to make a laminated longbow somewhere in the 100# draw range. Recently, I found a local lumber yard that deals in the finer species rather than construction grade material. In the storeroom, I found a 16ft long Ipe board that was originally destined to become someone's bannister railing. 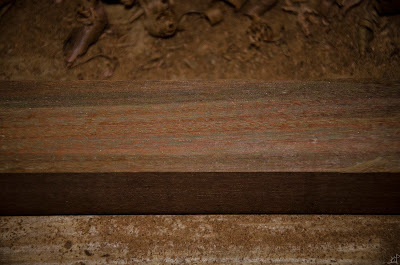 Ipe, a species of ironwood, is extremely dense, hard, and naturally resistant to fire and rot. 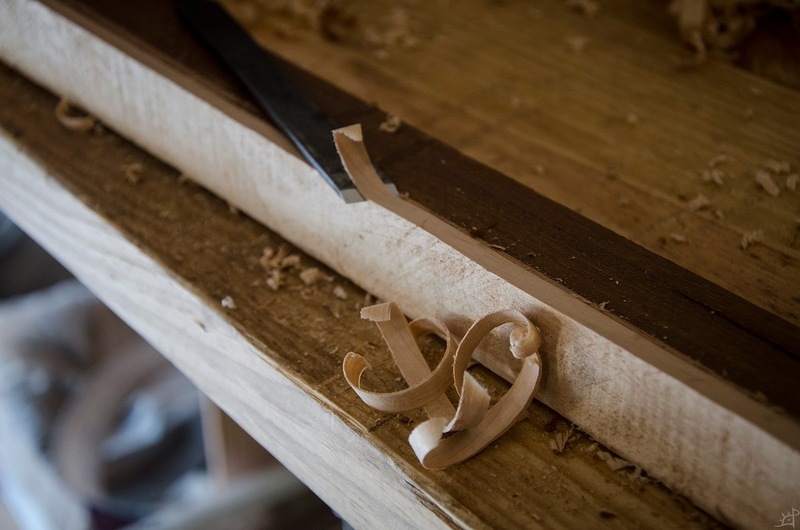 For bows, I have heard that it is a very powerful wood, but the grain can be extremely difficult to work. As a preface to this post, this bow did not survive the tillering process. The Ipe was horribly unsuited for use in a bow, and as a result shattered. I went into the project knowing that this might happen but decided to move forward if nothing more than for the experience of laminating a bow. The techniques and process are the same regardless of the nature of the wood, only the final result being the difference. Next time, I may try a more predictable wood that has fewer grain reversals and holds to generally more favourable characteristics than the Ipe (and the curly maple backing). 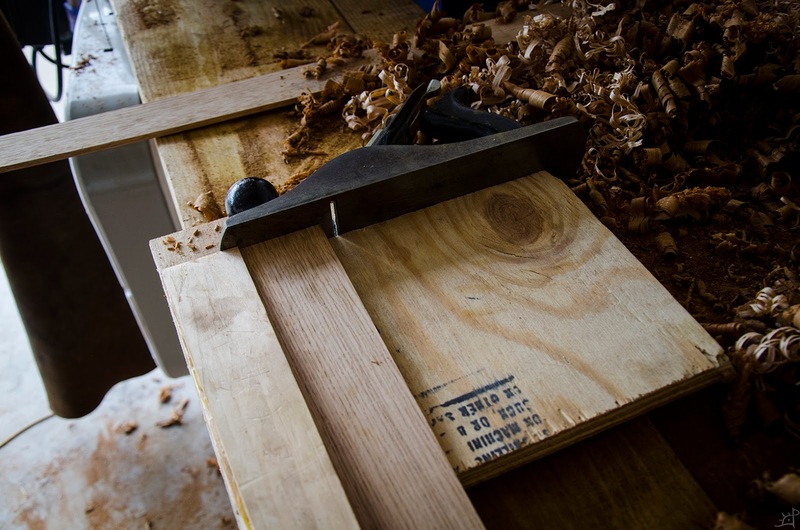 To begin, the Ipe board needed to be cut to size. 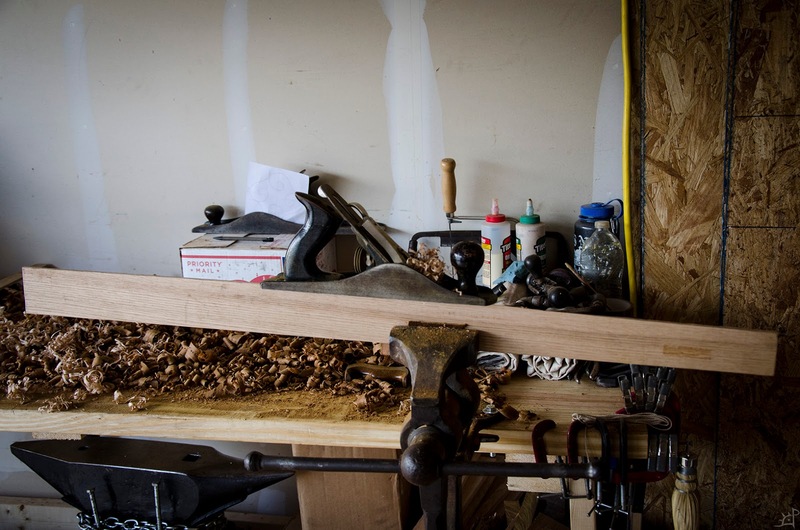 Without a table saw or band saw, the entirety of this project was done by hand. If you have never worked in the ironwood family, it doesn't have the name for nothing. 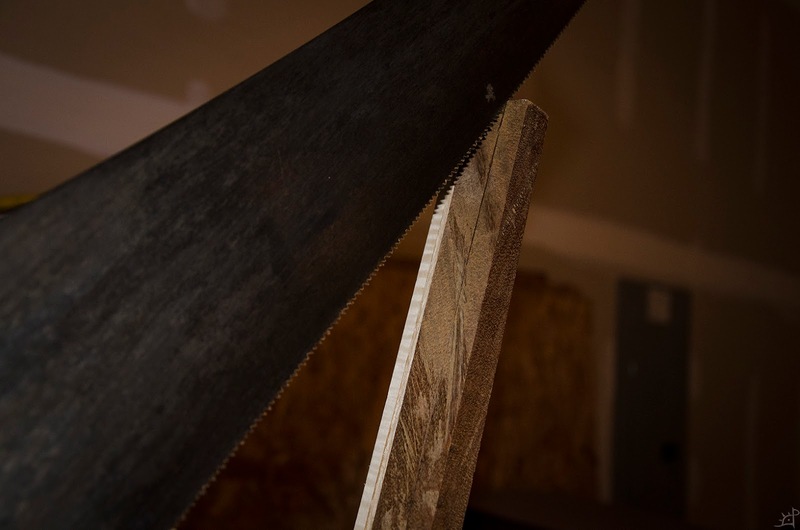 The wood is extremely hard and is havoc on saws. 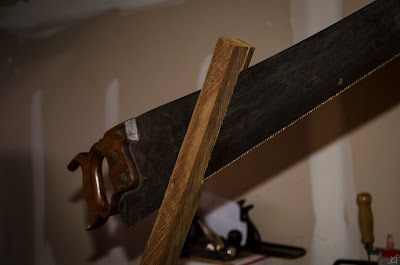 I needed to sharpen the saw three times over the course of cutting about 20ft of wood. 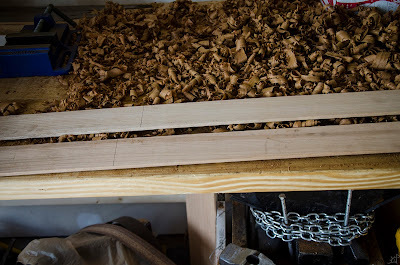 Originally, I was hopeful that I could manage between 6 and 9 bows out of the board, assuming the first one survived (which it didn't, so now there is a load of Ipe lying around), which means ripping the width twice to yield three staves. Because it took nearly six hours to make the first rip cut, I left the remainder for a later date. 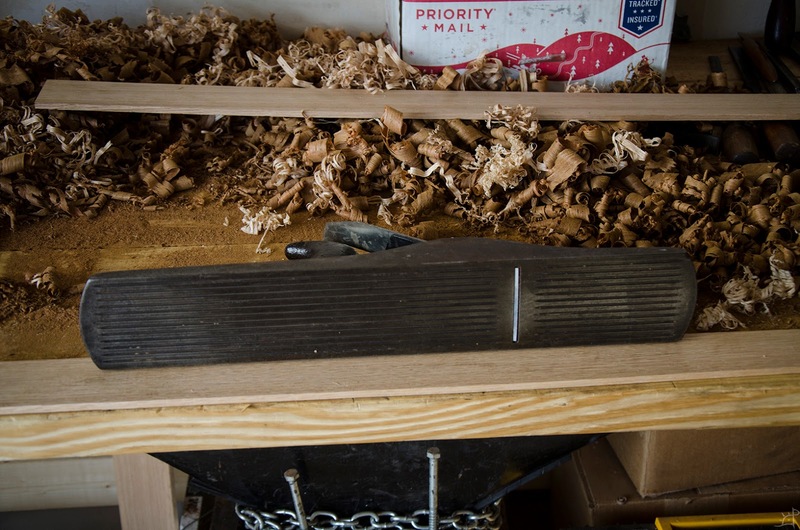 Because the bow will be laminated to other boards, it does not need to be as thick as the final bow. 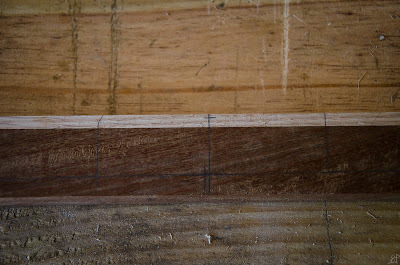 About 2" wide by 1.5" thick, there is a lot that will be removed, but that was my rough starting dimension for the Ipe. 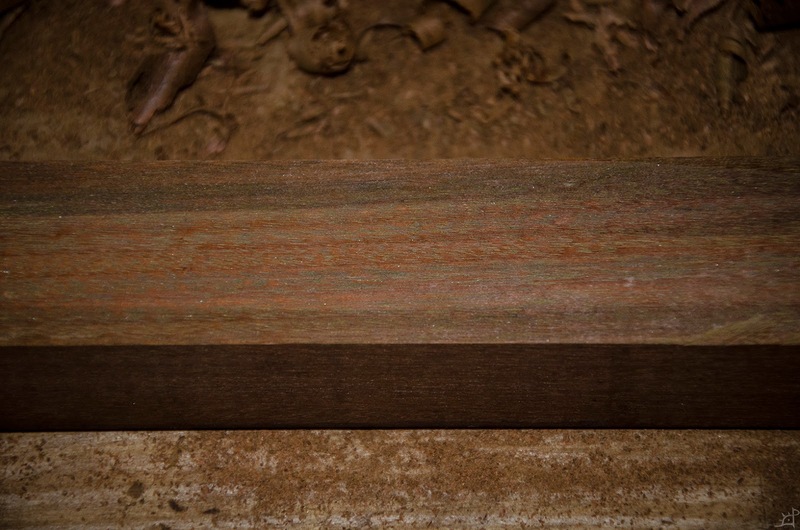 To prepare the surface for lamination with a red oak core, I planed the surface flat. This was when I realized the grain was about as bad as is possible to be for a bow. In the above picture you can see how it is diagonal across the entire length of the stave, where ideally it would be perfectly in line with its length. One thing that confused me was how irregular it is on the other sides. logically, you would see the same pattern and terminus on the three other sides, but on the face opposite it was much closer to in line with the length rather than running across. On the two sides, it was a total nightmare and almost entirely nonsensical. Here it seems better, but who can say? 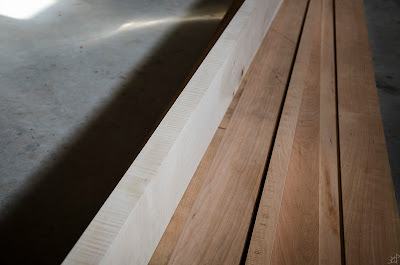 Ipe is, I was pleased, a generally nice looking wood that darkens significantly over time. 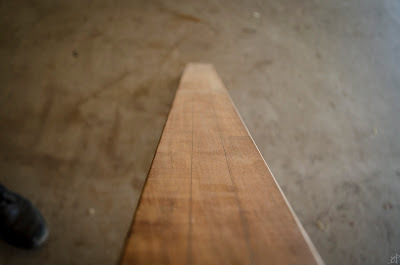 The uncut board is closer to a blend between dark walnut and mahogany whereas the freshly planed face is as seen above. Now that I have a squared board to work with, I marked the centre, 3ft. 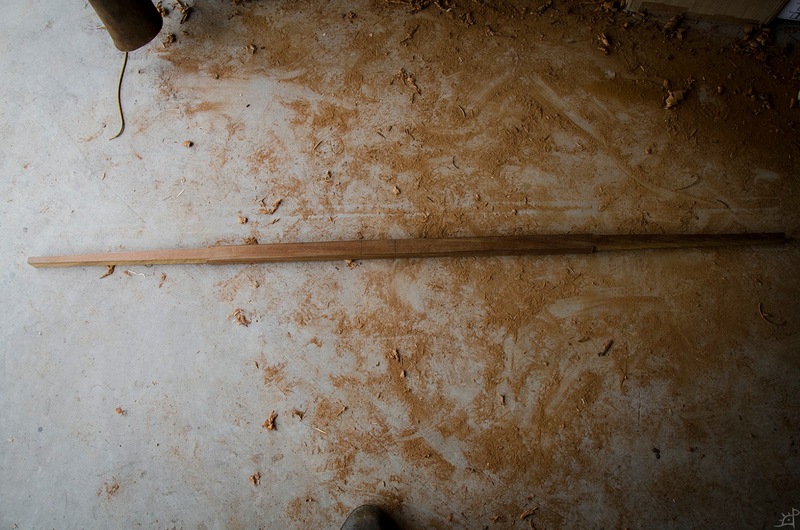 All the dimensions for this are comparable to those of the English longbow I posted years ago. 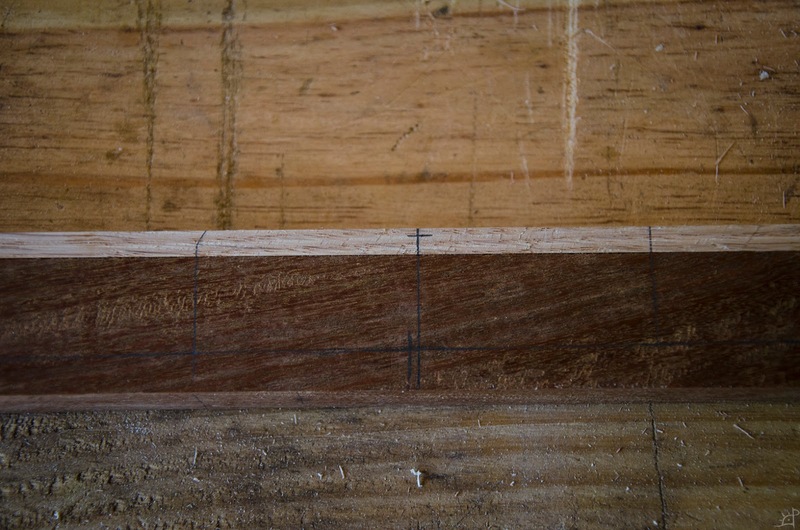 Similarly, I marked the centre of the stave at the middle. 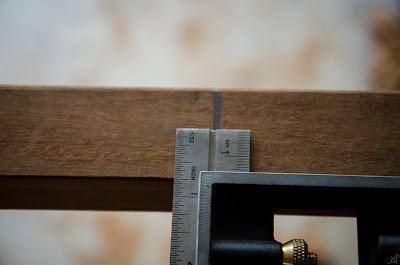 Due to the warping from the long cut, I could not simply mark the centre of the two ends, as it would no longer be in the centre at the middle. To compensate for this, I marked the centre of the middle and found the least distorted straight line across the entire length. That was done by pinning the end of a string on one end and running it to the other with a weight tied to it. 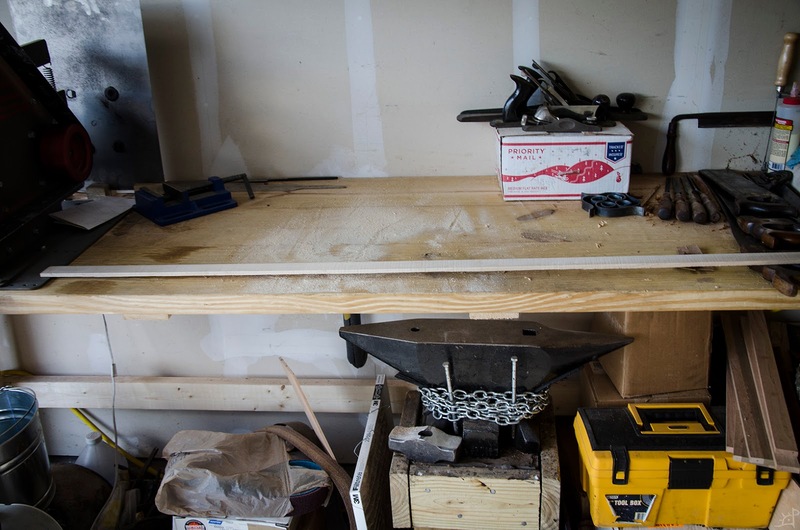 Before, I used a drywall chalkline, but I did not have ready access to one this time so I had to improvise with what was on hand. To find the path of closest symmetry, I moved one end of the string until the centre was in line, and if it was too far to one side, shift it back a hair and return the centre to centre by moving the other end. 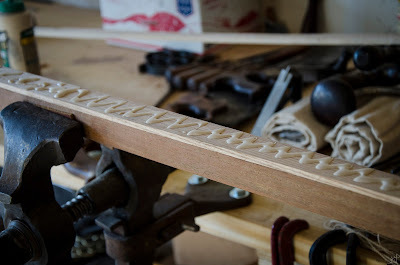 After a bit of trial and error, I marked a few key places on the stave and began laying out the taper for the limbs. Then more long rip cuts. 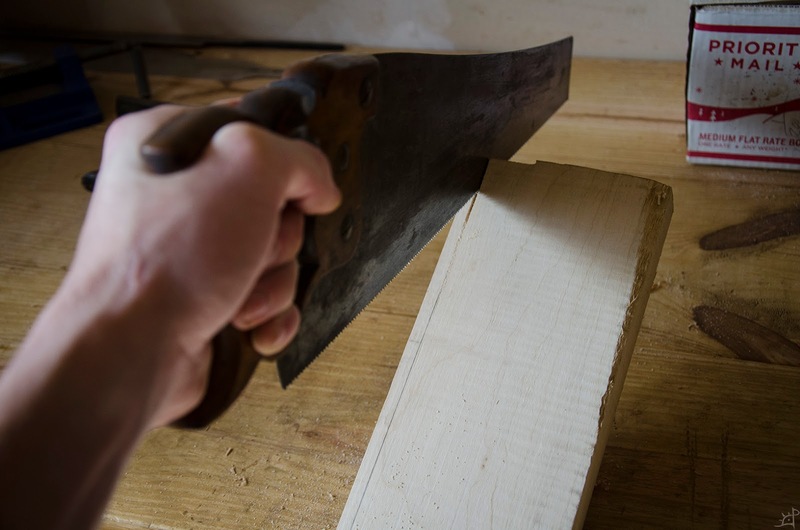 There was really no good way to go about cutting the Ipe. 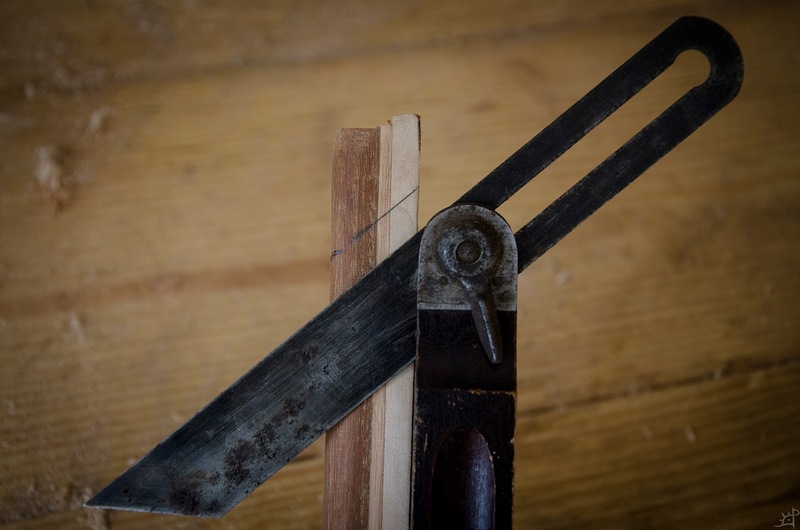 I was hopeful that it might be faster to use planes or draw knives or spoke shaves, but the saw still won out. 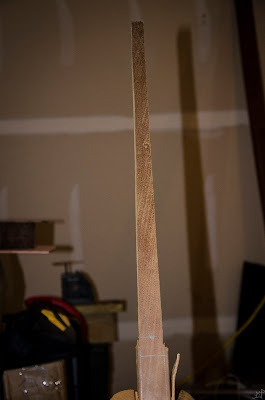 Some hours later, one limb was cut about 3/4 of the way to the handle. I stopped short because I was tired of cutting and the amount of material being cut rapidly approached the width of the saw. Sharpening the saw again, then onto the second limb. Finally, it started looking like a bow and less like a stick. 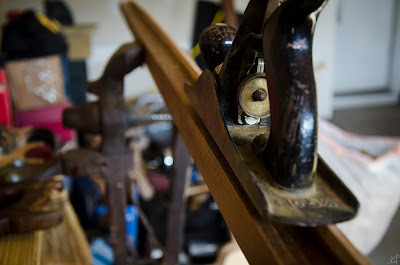 To match the taper of the limb back to the handle, it was at last time to retire the saw and turn to planes. 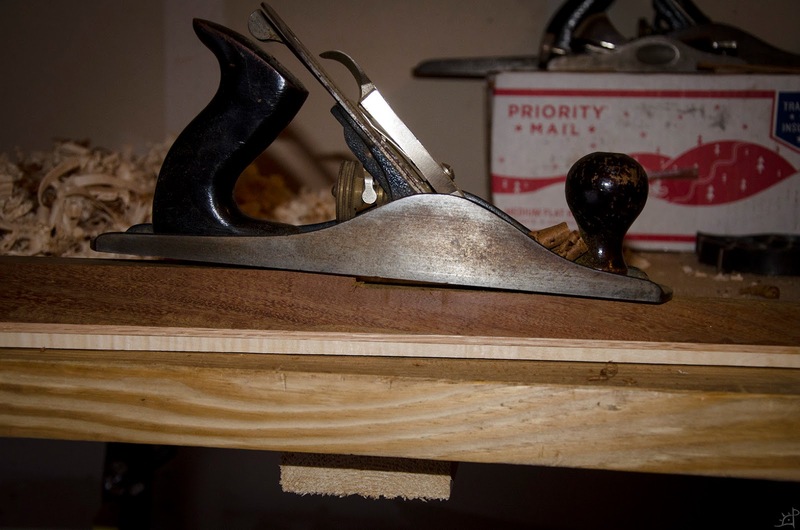 Between the jack plane and jointer plane, the limbs took an even taper from a 2" handle to 1/2" tip. Several years ago I found a pair of very straight grained red oak boards that would be perfect for backing a bow. Since then, they have ridden around in my trunk. A little worse for wear, they have several surface dents and scratches that needed to be planed out but overall were still perfect for the occasion. 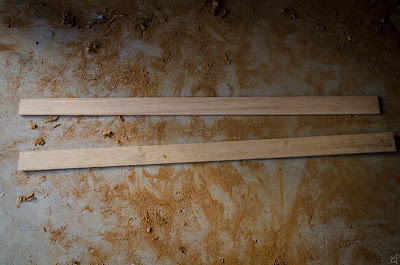 An extra foot long each, I found the best three foot lengths of each of them and cut away the excess. 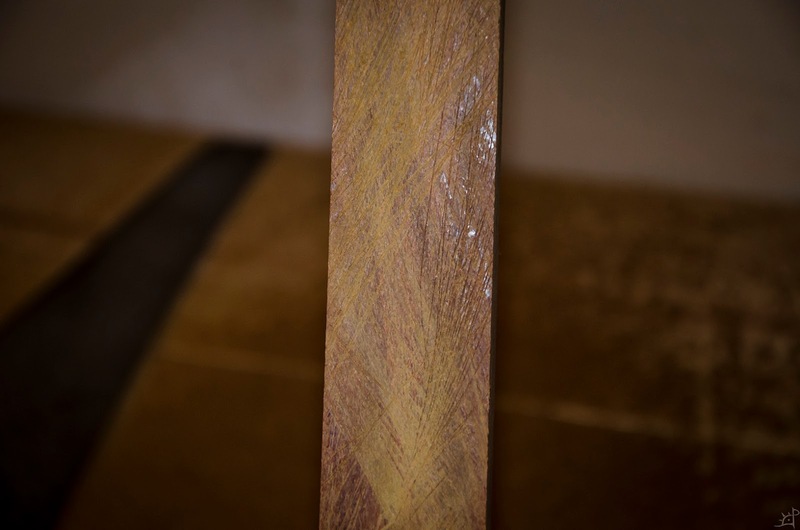 I was looking for the most consistent grain patterns, least amount of damage, and best match to the paired board. 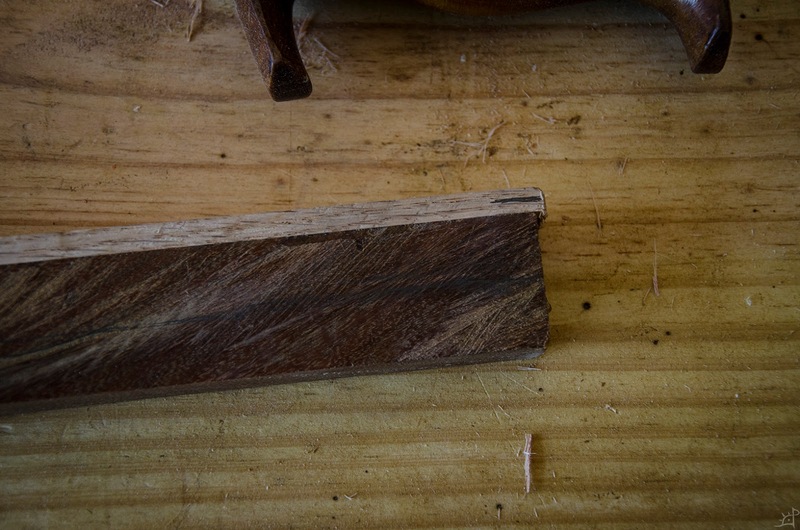 Due to the grain not running parallel to the edge, I fixed that by planing down the edges to form a secondary rectangle inside the original shape of the board. 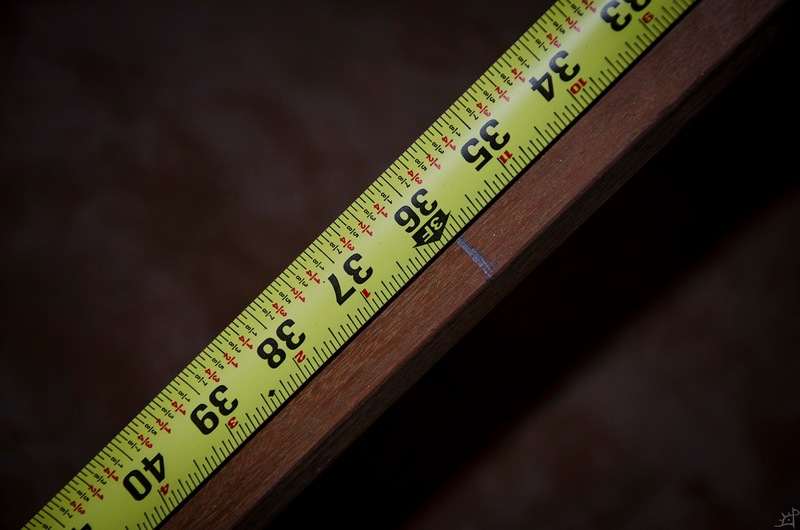 About twice as wide as I needed, there was plenty of material for me to work with. 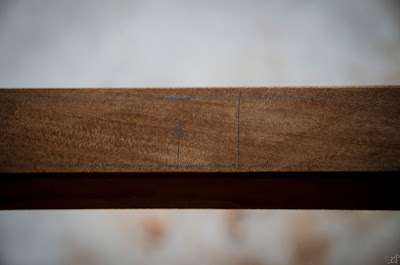 By cutting and jointing the new edges, I also have a surface against which can register the side of my shooting board. This allows me to square the end with respect to the grain direction, an important part of aligning the two pieces of oak in the middle of the bow. 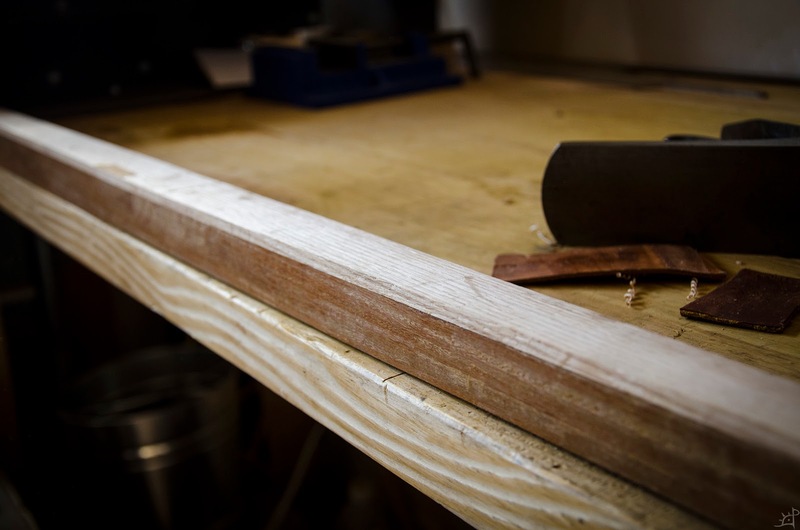 After the boards are square, the surfaces need to be prepared for gluing. 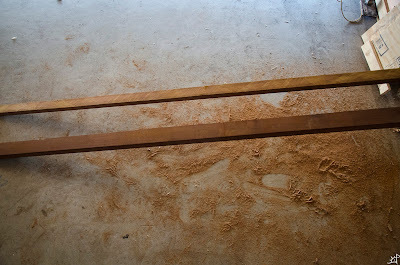 Due to the previously mentioned superficial damage, I planed the sides that would be face down and glued to the Ipe. 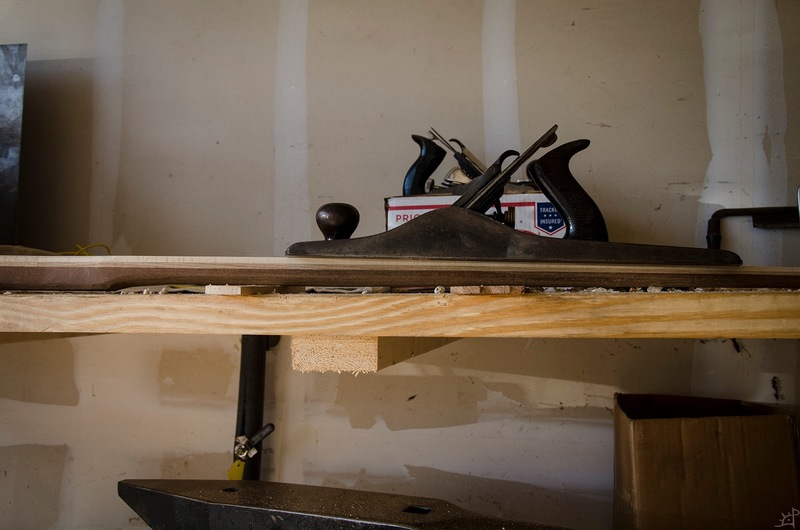 I only worked one side for the time being due to the nature of thin material to easily deform against my less than pristine bench. Although the surface was fairly smooth after the jointer plane operations, I used a cabinet scraper briefly to remove some of the hairline scratches leftover. Now the three pieces (one Ipe and two Oak) were ready for gluing. 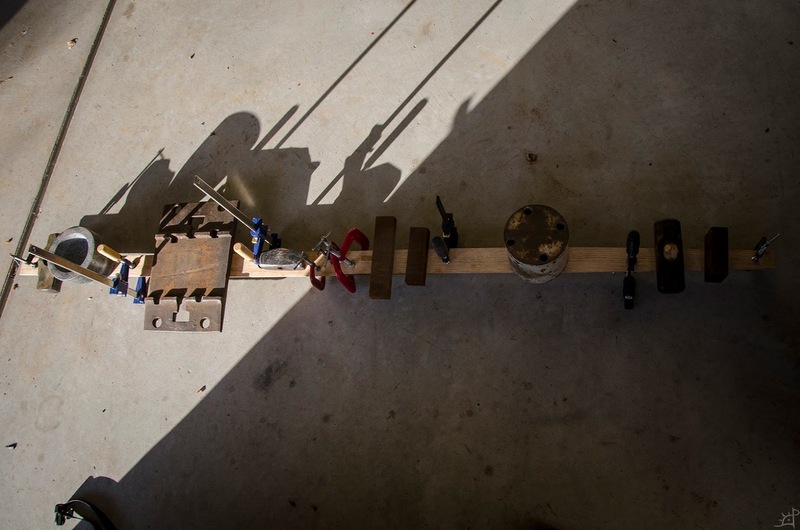 In spite of my clamp deficiency, I managed to supplement the clamps with various weights. Due to the rectangular nature of the oak and trapezoidal form of the Ipe, there was a considerable amount of excess oak that needed to be trimmed. 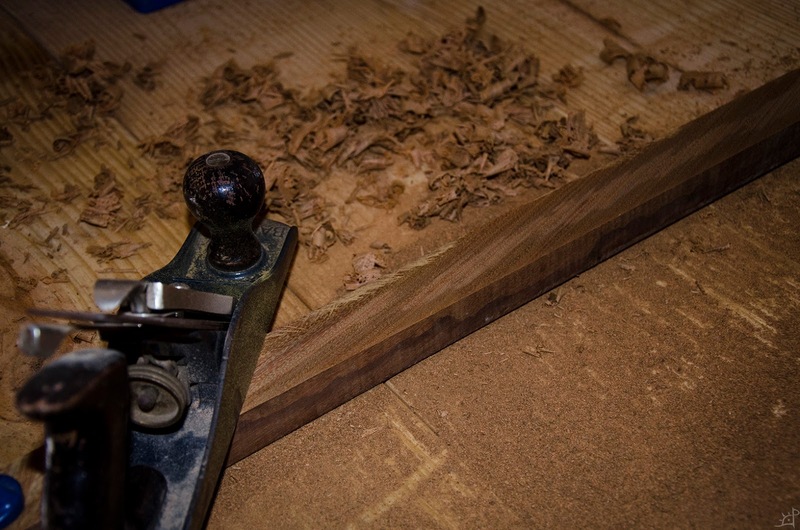 With the plane it was a quick operation that brought the overall stave to a consistent form. Here, I was also able to check the seams. 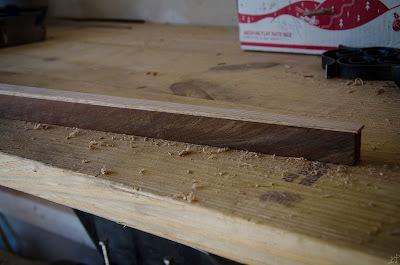 During another project, I had considerable trouble with humidity changes causing thin boards to heavily warp. 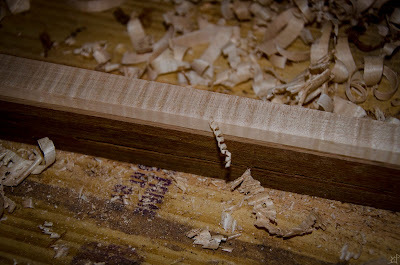 Fortunately, the oak came out without any of the cupping, leaving behind a seamless joint. More clamps in a parallel jaw configuration would have been a better and more predictable solution to the problem, but in the moment all I had were heavy objects. Before adding the final board to the lamination, I tapered the oak slightly to match the later tillering of the Ipe. 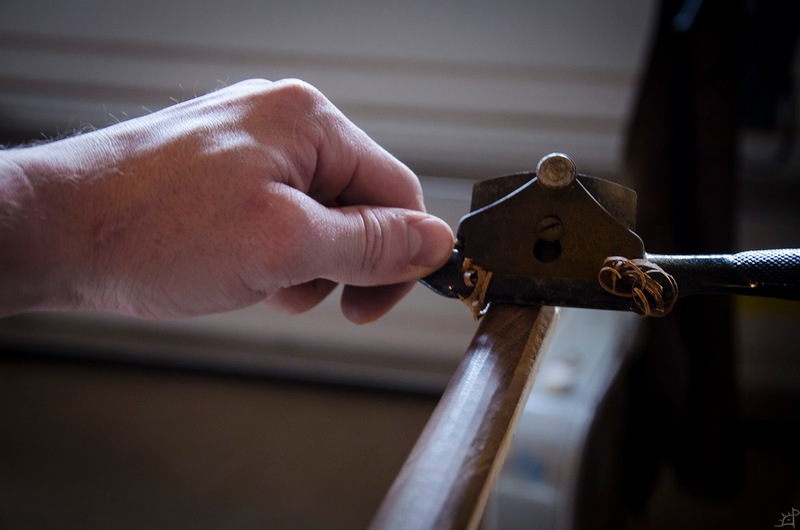 At the tips, there is less force applied than the centre of the bow, so the limbs need to be proportionally thinned in order to compensate. 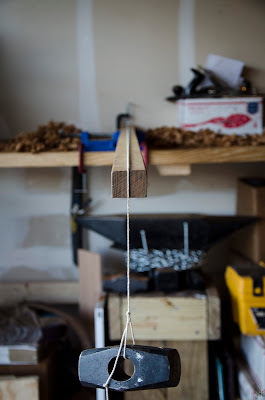 While I could have done this strictly with the Ipe, I thought it would look visually more appealing to taper both the oak stripe and maple backing. Concurrently with the bow project, I was building a kitchen table that had bands of curly maple in both the top and legs. 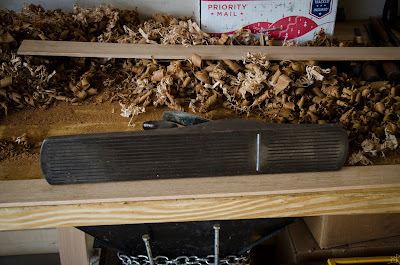 There was a bit of extra maple, so I cut decided it would be a nice backing material. Scribing a line at approximately 1cm, whose overall thickness would later be a bit less, it was back to the saw for a final rip cut. 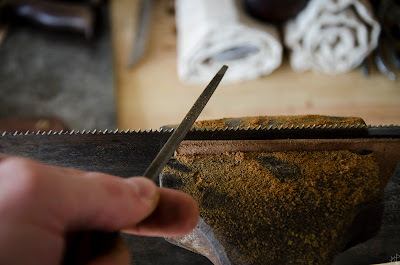 Shortly before this cut, I had to sharpen the saw again, which also compared to the Ipe made the maple feel as though it were foam rather than wood. 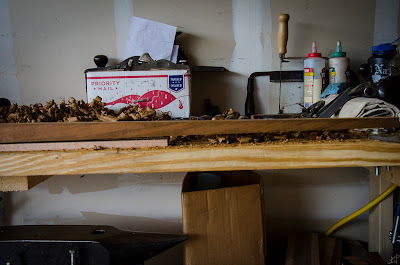 Just over 6 feet in length, I left a little bit of excess to be trimmed later so the tillering operations would not dent what would become the tips of the limbs, instead sacrificing the overhang. Now that I have the maple I can begin checking on the symmetry of the core. At the middle, the oak is at full thickness for the length of the handle, which is 3 inches from centre in both directions for a total of 6 inches. 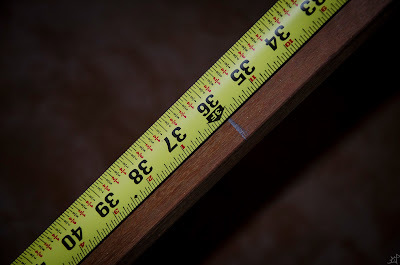 At the tips, the thickness is somewhere around 2 mm although I do not recall the exact measurement. Because the majority of the power will be coming from the Ipe, that dimension is not critical as long as it is not too small. 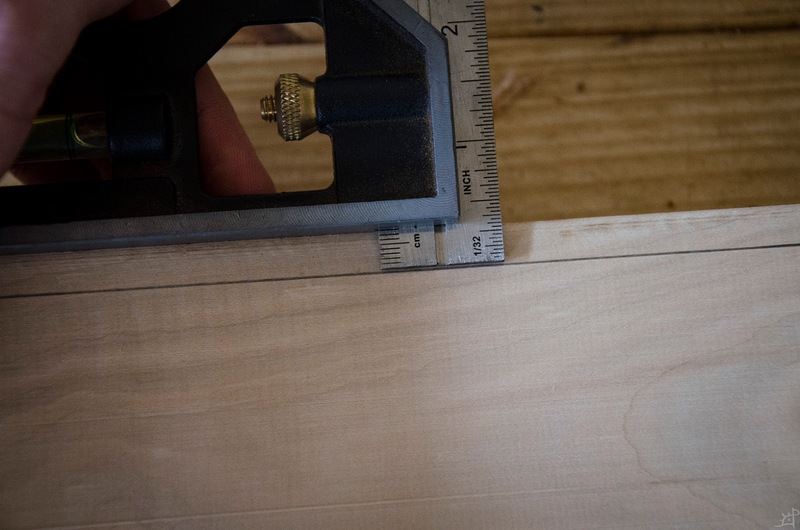 With those two measurements marked, I used the jointer plane to make an even relief between thicknesses. Then added glue. The curly maple I cut had one face that was already jointed, so I used that as the glue surface rather than going through the effort of jointing the one I cut. Planing material to an even thickness is easier for me in my current shop when it is backed by a thicker material that does not bend to the shape of whatever is underneath it. That allows me to be more precise overall, making one face pristine then waiting to work the other if the project allows. 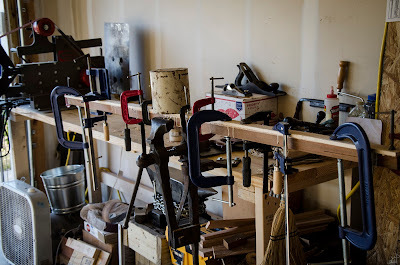 Same as before, clamps and weights in excess. 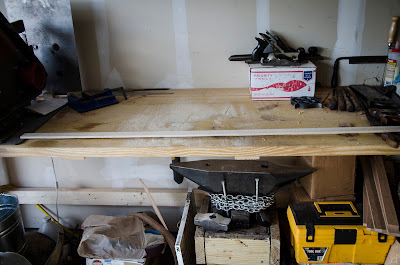 Due to temperature swings, I had to leave this clamped for two days. Once cured, it was back to work. As with the oak, there was some overhang that needed to be trimmed down before tillering. At first I thought it would be reasonably fast to use the plane, but there was so much material that I turned to chisels for very rough but rapid removal. Then, the edges were made flush with the slightly more delicate planing. This curly maple is what I had problems with before, but here it behaved and left me with no gaps anywhere along the length of the joint. 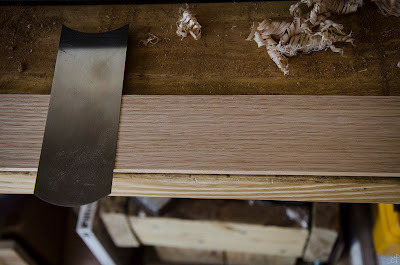 Just when I thought I was done cutting, I returned to the saw for a final time in cutting the belly taper. 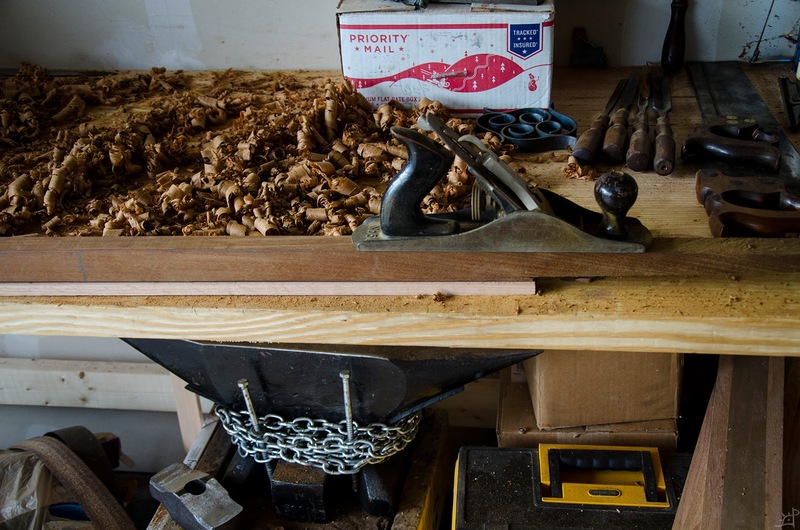 This served as the first step towards tillering, allowing the limbs to bend more evenly along their length. Since this was intended to be a much heavier draw than the other bows I made, the cut was not at an exact distance, but rather a starting point for the subsequent removal. 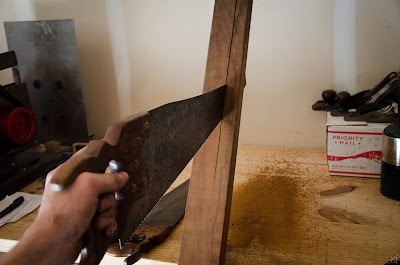 After both limbs were cut, I blended the final corner near the handle into the taper, same as with the profile earlier. Transitioning from a square or rectangular cross section, I used the spoke shave. This is new from the other post many years ago, as I was not overly familiar with how to set the irons at the time and strictly used a plane. The Ipe, due to its horrible grain issues, proved difficult for the plane, as it kept reversing in direction. 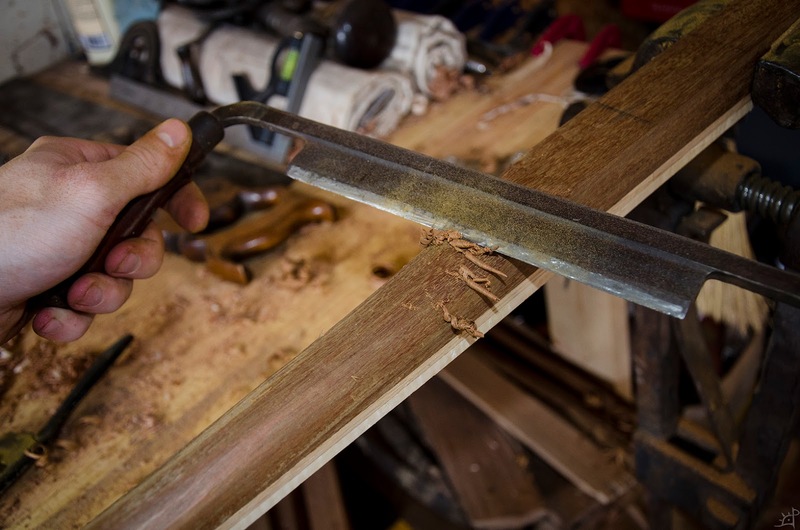 With the spoke shave and later drawknife, I was better able to navigate the limbs and see what precisely I was doing. And, these tools are generally better suited to this sort of work anyway. 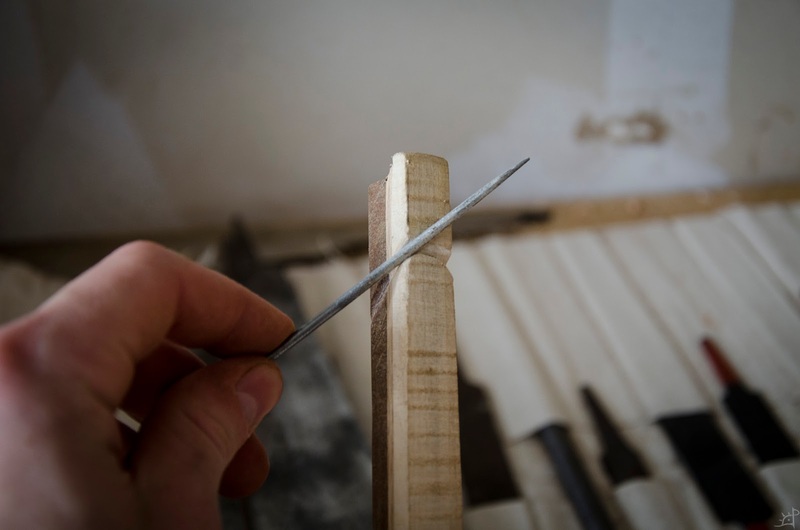 At the handle transition, I could not fit the spoke shave in the radius, so it was done entirely with the drawknife. Set to around 45 degrees, I laid out the lines for the nocks. 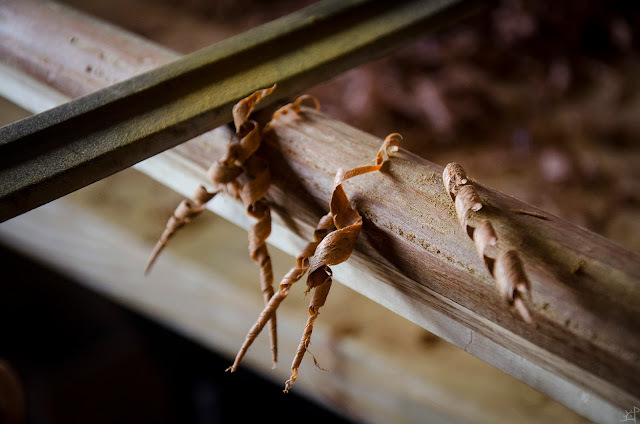 These would become temporary tillering nocks cut deeper (on a thicker limb) so as to better accept the string without slipping at low angles of draw. Similarly, I extended the nocks to the front of the limbs. Some people do not do this for the potential of splitting the backing wood, but again, the limbs are thicker than they ultimately would have been, so that trough would be removed entirely before the end. With some semblance of tapered limbs, I did a quick test to see how they bent with regards to one another and as a check for any hinges. There is still a long way to go. 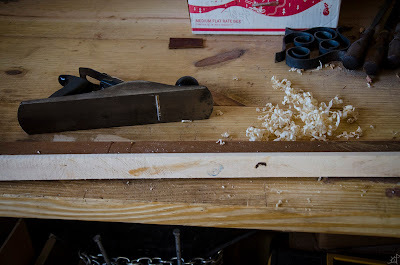 A few hours into tillering, I decided to transition into removing maple rather than the Ipe, as the maple is far softer and relatively non essential to the power of the bow. 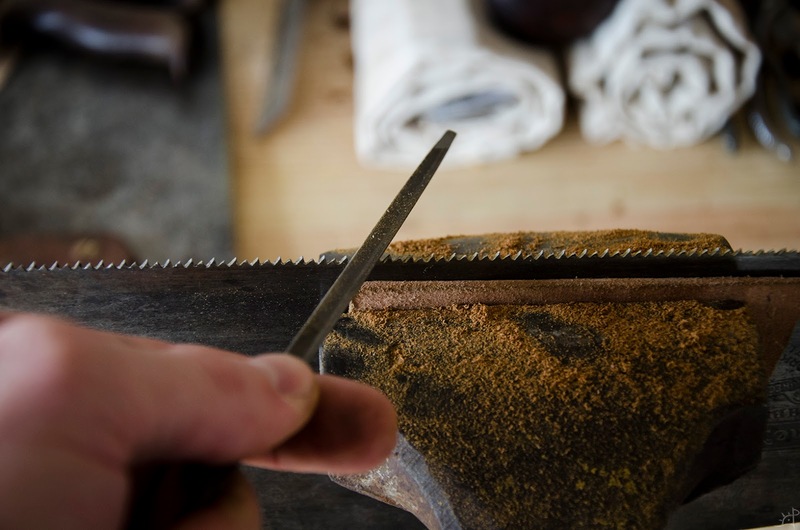 By removing the backing, it allows the shear line (where there is neither compression nor tension in the wood) farther into the Ipe. Due to the grain problems, this means less chances for grain related failure. Then, it was back to working the Ipe. 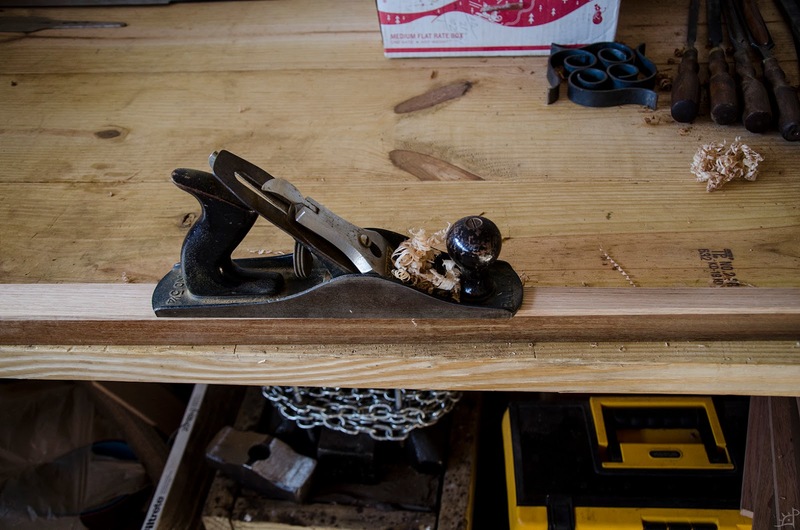 Every handful of minutes, I would string the bow and bend it, checking for symmetry and hinges. Then, I felt rather than heard a crack begin to pass through the bottom limb. An imperceptibly small amount of time later, the limb shattered and there were splinters everywhere. About half way down the bottom limb, the Ipe failed, taking with it tremendous bits of oak and maple. There were three main pieces, the one still tied to the tillering string taking with it a bite of my left hand. 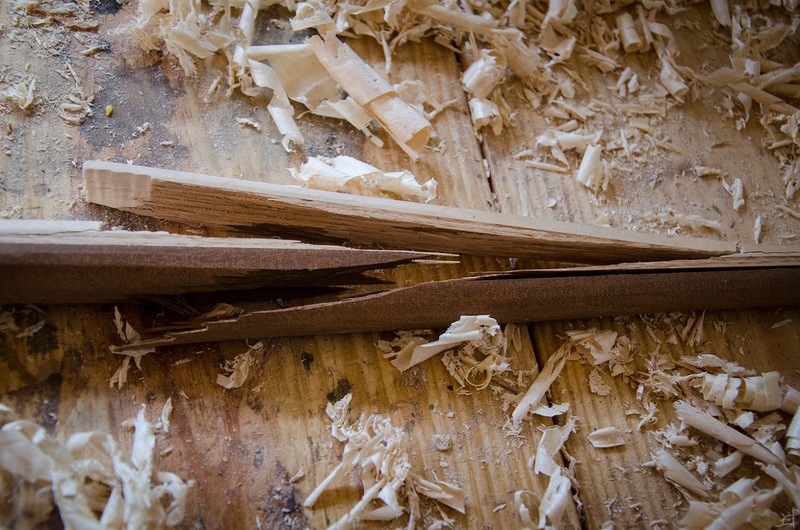 Fortunately, most of the energy went into breaking the wood rather than turning it into projectiles. Although I was half expecting this to happen, it was still disappointing after having invested as much time into it as I had. By recording the process, it also gave me the opportunity to share more of my failures, which to me are often times more valuable, as they show you in very real ways what happened to the contrary of your practical expectation. Next time, perhaps the lamination will survive.